Find and compare the best prices from a range of well known car rental companies at Paris Airport. This is a free to use facility, enabeling you to book direct with the company quoting the price. 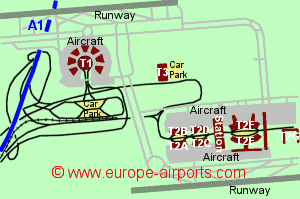 Paris Airport, otherwise known as Charles de Gaulle Airport, is located 26Km North East of the centre of the capital city, Paris. 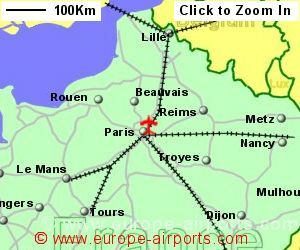 Charles de Gaulle airport is connected to the urban train network link to Paris via stations at terminals 2 and 3 while the high speed TGV is available from the station within Terminal 2. In late 2016 it was announced that a new high speed rail link with the city centre was planned for completion in 2023. Currently, a train into Paris takes 35 minutes and costs around 12 Euros. A free automatic light rail shuttle known as CDGVAL connects the terminals, the two train stations and remote car parking. Trains run every 4 minutes during peak times. A taxi ride into the centre of Paris is likely to cost around 55 Euros. Charles de Gaulle airport has the restaurant, banking and shoping facilities (around 280 shops) you would expect in a large international airport. WiFi Internet access is available in many areas of the airport. 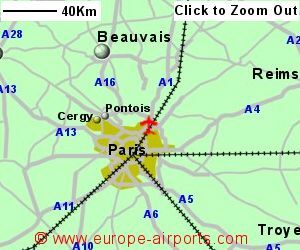 Paris CDG airport has Airport Carbon Accreditation, at the Optimisation level. 69.4 million passengers were handled by Paris CDG airport in 2017, a 5% increase compared to the previous year. Paris CDG is the busiest airport in France, second busiest in Europe(after London Heathrow), and the 10th busiest in the world.